I have little animosity for the virtual people I shoot in video games. They are cardboard targets. The worst they can do is kill the virtual me. My "death" lasts a few seconds. I can't hate them for that. I played the beginning of the upcoming first-person shooter Homefront and I felt a burning urge in the game to do right with the trigger of a virtual gun. Homefront is set in a near-future United States that has become occupied by a bellicose unified Korea. Early on, in what would be cliche in film but feels novel in a game, my character was arrested in his U.S. apartment by Korean occupation police, handcuffed, shoved into a bus and forced to ride past lines of Americans taken prisoner. As the bus rolled past, I saw enemy soldiers roughing up civilians. And then I heard the pitched, despairing voice of a mother telling her child not to look. To turn away. To not let what was going to happen next be an unforgetable scar. The scene came into view: a child wailing as his parents are lined up against a wall and shot to death. I wanted to climb out of that bus and take action. Soon, a resistance fighter rammed the bus with a truck, freed my character and handed me a machine gun. For the first time in a war game, I wanted to make the bad guys pay. The murder of the parents was disturbing. "I'm still on the fence about that one," David Votypka, the creative director of Homefront told me after I finished the half-hour of action that followed that scene. Homefront is unusual simply because it has regular people near its lines of fire. What could sound like familiar plot device in another form of entertainment has the shock of the new in this adventure. It is the shock of making the player fight through an unpleasant situation, one that feels less macho and more desparate. Later in the opening level, as my character machine-gunned through Korean occupiers with other members of the American resistance, I wound up fighting through a house, past a mother cradling a crying baby who had to take cover as Korean forces rushed closer. The creators of the game say that one of their mandates is to show "how warfare affects civilians." In doing so, it feels as if it can stir the passions of gamers like me who typically lack any emotional connection to their virtual enemies. The lead level designer of the game, Rex Dickson, told me his team has heard it from the people who try the level I played: "I really want to pick up the gun," they say. I asked Dickson if the goal was for Homefront to make the player feel anger. "Our goal is to make you feel emotion," he responded. The narrative single-player part of Homefront has been created by New York City-based development house Kaos Studios. They've worked with Apocalypse Now and Red Dawn screenwriter John Milius to craft their tale and its tone. Milius, Votypka told me, brought them down to earth. Milius discouraged the game developers' original vision of an adventure that had the player heroically helping the military take back the U.S. He helped them craft something more intimate, a desperate journey by resistance fighters to transport fuel from Colorado to California. In making the story less grandiose, they've also given it more grit. They've cast the player as part of a resistance that, Milius prodded them, can't always be politically correct. Lead supporting characters argue about their own tactics, of how brutal or noble they should be. Homefront is a game targeted at American anxieties, one primed for jingoism. This is a near-future America crippled by economic downturn and invaded by a surging Asian rival. Its portrayal of the Korean enemy will be tempered, though, Votypka said, by a discovery in the game of an internment camp where Korean Americans are held, a reference to America's treatment of its Japanese citizens during World War II. It feels more unsettling than the war games I usually play. That, of course, begs the question as to whether a video game that might upset its players can be broadly appealing. So often, the number one goal is for the player to have fun. Can you have fun while you are upset? There is plenty of power-fantasy in Homefront. Once you have a machine gun in hand, you are a mighty warrior capable of gunning down dozens of enemy soldiers. You fight through fantastic vistas of wrecked suburbs and eventually command a remote-controlled tank that can obliterate enemy forces with a knockout punches of firepower. But you are fighting alongside that mother and her wailing baby. You are reminded there are regular people in this conflict that sons have mothers, that guns shred families. There is a line, of course. In video games not only is there always a line, but it often feels so much more carefully drawn than the ones movie directors or authors discuss. That mom and her baby cowering in the middle of a firefight can't die in Homefront, not from friendly fire, not from enemy fire. The developers didn't want to cross that. Dickson identified a narrative justification: the enemy is focused on killing the armed resistance fighters near her, he suggested to me. It's hard to think of it that way in the heat of that virtual fight. Mom and child seem vulnerable. The wrongness of the fight feels apparent. And so, in this game, you can get lost in an uncommon video game emotion: anger that hungers for justice. Kaos' creation is a game for people "tired of a shooting gallery," Dickson said. It's a war game meant to get a reaction. It's one that, Votypka said without spoiling things for me and you, will give players other uneasy moments beyond the ones I experienced. This is a war game that gets closer to what is awful about war, not just about what victors celebrate. 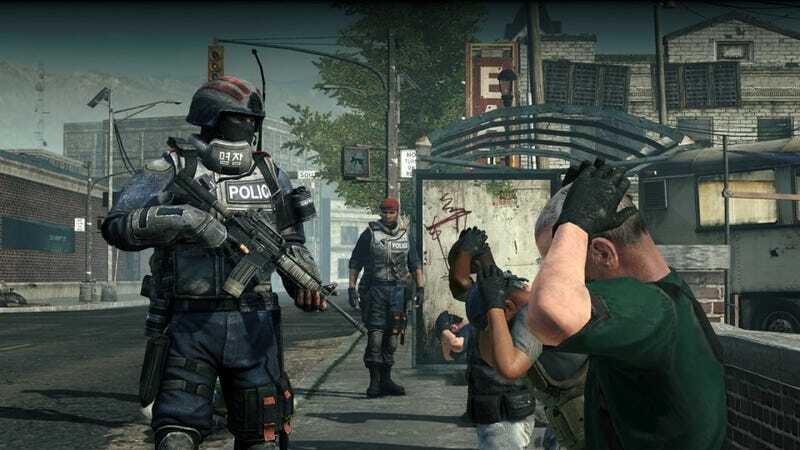 Homefront, which also has a less emotionally charged multiplayer mode, is set for release in early 2011 on the Xbox 360, PlayStation 3 and PC. Homefront Multiplayer Impressions: Let&apos;s Go Shopping!